The upcoming commencement ceremony not only brings a wave of excitement and a new chapter for the upcoming graduates, but revenue for stores, restaurants, bars and hotels. “It’s treated on the business side much like a football game”, explains Jake Grant, the assistant general manager of the Hyatt Place in Athens, when asked about the upcoming ceremony. Recently built hotels such as the Hyatt Place in Athens have seen a business boom following the successful football season. “It’s all about the demand,” Grant states. This success will continue to hit hotels until graduation on May 4th. The business boom that hotels are experiencing has added stress for parents and family members planning to stay in Athens on graduation night. With only a few selections left for hotels, people planning to attend the ceremony are forced to stay far away from Athens, GA., or pay a pretty penny. That is, if there is even space available. According to Trip Advisor, there are only three hotels left in the city of Athens alone with the average price of $300-$400 per night. The limited rooms will continue to increase the rates per night as the date of graduation approaches. 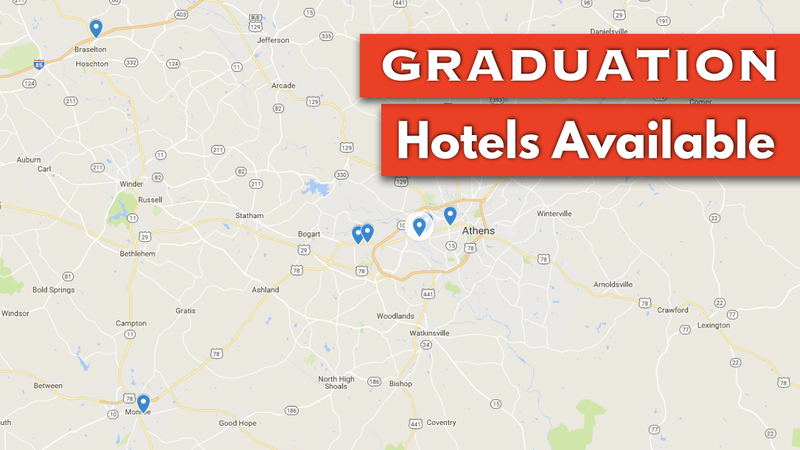 Seven hotels remain around Athens for graduation.